Unlike straightforward clients, account analytics and discovery services are one area of third-party development that Twitter is positively encouraging, and Twtrland, which launches today, may well be the best example out there yet. 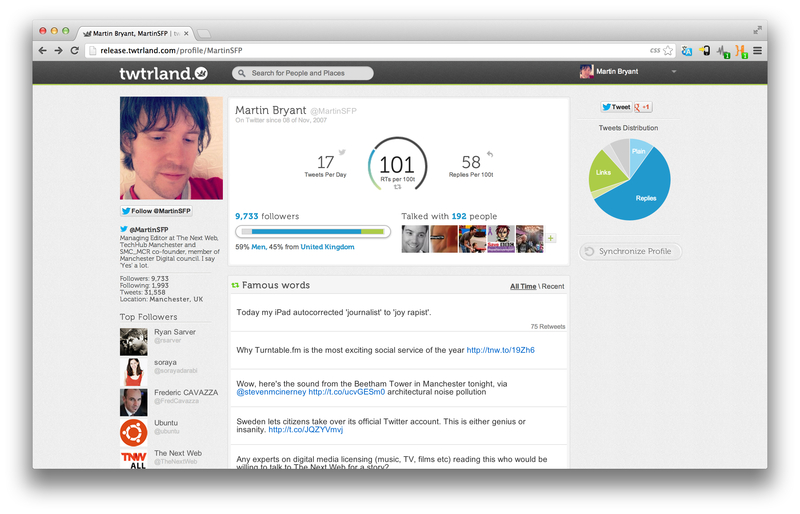 The idea of Twtrland is to offer deep-dive data about people and places on Twitter, with the aim of finding new and interesting people to follow. Pull up your own account and you’ll see data about your tweets, your followers, the photos, videos and other media you share and much more. That would be pretty standard fare on its own but then you can really dig into that data. Want to see what Twitter power users from France follow you? Or if any female celebrities aged 20-40 follow you? All of this information is just a couple of clicks away. The real power here is that it’s not just about you. Want to get a grasp for your company’s Twitter audience, or a celebrity’s followers, it’s all easily accessible. 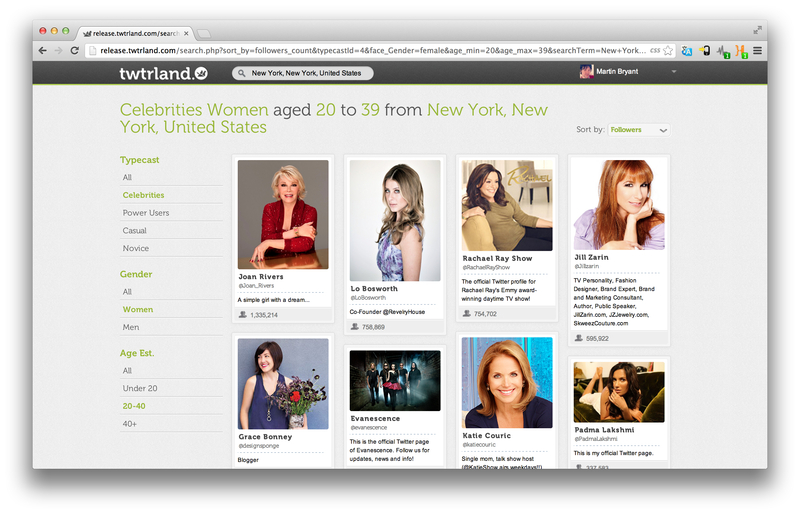 Want to find the novice Twitter users in your home city, or celebrity women aged 20-39 in New York City? Again, it’s easy. While it looks simple enough, there are some clever things going on behind the scenes here. Twitter users’ ages, for example, are determined by image recognition and audience analysis. Twitrland was founded in April 2011 and took part in the first run of Microsoft’s accelerator in Israel earlier this year. The startup is funded by the likes of Israeli VC firm Magma, and Jeff Pulver. Next in line to be added to the product will be extra networks and enhanced search capabilities. In terms of monetization, founder & CEO Eytan Avigdor says that premium services may be added in the future for professional use. Nicely presented and easy to use, Twtrland is the perfect accompaniment to another favorite Twitter analytics tool of ours, SocialBro. While the latter has more functionality in terms of being able to mass follow/unfollow groups of people and finely segment your Twitter audience, Twtrland offers a high-level overview of the people and places that make up the Twitterverse.